*This isn’t exactly about a memory verse that I taught my girls, but is more about the lesson plan I came up with to teach them about communion. I didn’t have them memorize the scriptures used in the lesson, just used them to get the message across. 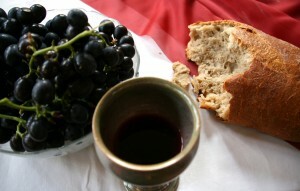 Even though my children are still young, I felt I needed to start now in teaching them about communion. At our church, we try to partake in communion at least once a month, sometimes more when our Pastor feels led for us to do so. On one occasion several months ago, as we were getting ready to have communion, my oldest daughter, Naomi, wanted to do communion with us. Naomi is 4 1/2, but she thinks she’s at least 12. 🙂 Her dad and I talked it over and we decided that we wanted to go ahead and teach her about communion. We wanted her to know what it means and why we do it, so that she could understand and have part in it. I did a little bit of research, but for the most part, I created a lesson plan that I believed fit Naomi’s level of comprehension (preschool/kindergarten). Through the lesson, we taught her the importance of communion and that it is a very serious event. Although it’s a kid-friendly lesson, it still shows the significance of what communion is all about. If you’d like to check out my lesson plan, you can find it here. I also found a coloring sheet online at sermons4kids.com and printed it off for Naomi to color after the lesson. You can find it here. Once we completed the lesson, we prayed together and held communion as a family. Now when it’s time for communion at church, Naomi is allowed to join us because she has an understanding of what is going on. Through the lesson, she realized it’s more than just grape juice and communion bread. It’s more serious than that. How about you, Moms and Dads? Do you realize the seriousness of communion? Or has it become just grape juice and bread to you? Maybe we could use a refresher course on the importance of communion ourselves…It’s really all about how much love our Savior has for us. And that love is a LOT.